Speaking at the signing ceremony on January 10, Deputy Minister of Industry and Trade Dang Hoang An affirmed that the Nhon Trach 3 and 4 power plants, invested by PV Power, will be the first power plant chain in Vietnam using imported LNG for producing electricity. With a combined capacity of 1,500MW, it is hoped the plants will meet the increasing power demand in key economic areas in the Southeast region. According to representatives from PV Gas, domestic gas resources are declining. They forecast that Vietnam will begin to have a shortage of over 2 billion cu.m of gas per year by 2023. The shortage of gas would continue to increase rapidly to over 7 billion cu.m per year in 2030 and 9 billion cu.m per year in 2035, especially in the Southeast region. They said LNG is the solution for maintaining economic growth and promoting socio-economic development in the coming time. With a designed capacity of 1 million tonnes of LNG per year, the LNG Thi Vai Terminal – which is invested in by PV GAS and scheduled to be completed in 2021-2022 – will be an important link in supplying regasified gas for many consumers, including the Nhon Trach 3 and 4 power plants. According to Deputy General Director of the Vietnam Oil and Gas Group (PetroVietnam) Nguyen Quoc Thap, PetroVietnam will continue to provide its support for the LNG projects, aiming to complete them on schedule and ensure their highest efficiency. As key units of PetroVietnam, PV GAS and PV Power will continue to promote their cooperation to develop economic value chains, as well as development orientations for the local electricity and LNG industries in the future. Since providing the first gas flow to the Nhon Trach 1 power plant so far, PV GAS has provided PV Power with 12.7 billion cu.m of gas for producing electricity. 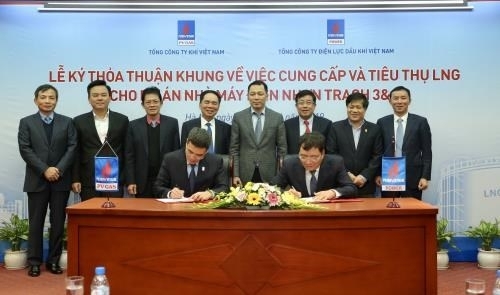 After completing procedures, PV GAS and PV Power will sign an official contract, connecting the Nhon Trach 3 and 4 power plants to the national grid.